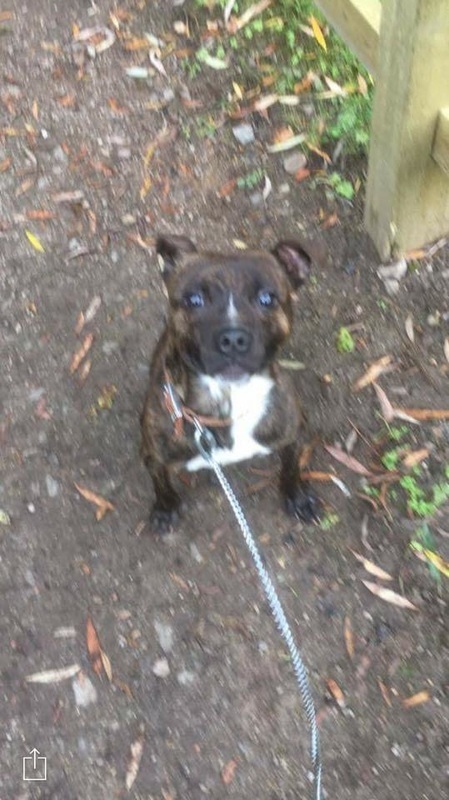 Vinnie is a 10 month old Staffie (his chip info simply says he was born in 2015, he may be a few months older!) He will be coming into foster with us very soon. Vinnie has had virtually no training at all - the following is from the lady who stepped in and asked us to help him. It is a very long read but we want you to be under no illusions about his lack of training - and how quickly he does learn new things. A calm, older dog would help him - but not a dog who would think "this is great, lets both play up". No children (teenagers upwards) simply because of his love of grabbing the lead and may nip in excitement. Obviously while Vinnie is so excited and lacking in manners we are unable to conduct a cat test. If you are interested in adopting Vinnie please contact us . Homecheck and a donation apply. Massively excited when you get the lead out - put it on and persistently tries to grab and chew it. Reacts well to food and praise / food so I don't think he would be massively hard to train. Reacted a little to some passing cars - I think he just wanted to know what they were tbh. Seemed keen to meet passing dogs but not barking - we will try and test this over the next few days. Has showed no aggression at all - ripped ham from our fingers but just through lack of manners other than malice. We could also put hand in mouth (with care!) to attempt to remove lead... the ham worked better though! Friday evening walk... Vinny went into full on, Kill the lead meltdown! Bit through harness (thought we might try a harness on the off chance that he may react better to it) so we attempted to revert back to lead. No go; impossible to distract / was in full on manic mode bitting the lead. Ended up having to pick him up to calm him down; but he was pretty wired still! It was really quite a bizarre situation! We wondered whether he was just over excited - think men mean excitement... lead means excitement. We had Dottie (another dog) with us as well and maybe it was just too much... he was just beside himself with excitement when he saw us...His owner said that she thought he was essentially waiting for us... As if he knew we were on the way! So Saturday, I took him out by myself and I invested in a clicker! Great walk! Literally no real attempts to grab lead whilst we were out. As soon as we were within sight of home; he heard young kids playing and started to get excited! And then within seconds went into a mini melt down chewing the lead just as we got to the flat! So When we finally made it in, i just sat with him for 5 mins trying to calm him before leaving - kind of worked. Today; took him out earlier in the day so as to take him a little by surprise. He was ok; but the minute we had to stop to let a local charity run go by; he went into attacking lead / manic melt down again... Nothing distracts him at this point so just had to sit it out until he released the lead long enough for me to get him moving again... I'm sure people thought I was bonkers sat on the floor with a dog who was clearly somewhat possessed!!! Anyway... got going eventually and all great again! Only a couple of minor attempts to grab lead but able to stop full blown meltdown. Met a few dogs on walk; walked with Clumber spaniel beautifully! Howled like a banshee when we had to part ways with spaniel. Wanted to walk more with him! Clicker works well when walking. he is actually turns round to look at me every now and again to make sure I'm there, when I call his name whilst walking he immediately stops sits and looks at me for reward so this is really promising! Had mini meltdown as approached home again chewing lead but managed to snap him out with alternative lead & reward. Was a German Shepard walking behind us and this massively helped as his attention was directed to him. Had a fuss, no problem but reverted back to trying to nail the lead as we got closer to home! Made it in and again Sat with him for 5 mins to try to calm him down. Put lead on floor and he immediately picked it up to chew in his bed. introduced 'leave' command with a touch and coupled with the clicker and freak, i think he did start to get it! 5) although I'm sure he loves kids, I would be worried about little hands near lead... when he goes for his lead, he looses it completely and is very hard to control.